Greek banks will reopen on Monday as Prime Minister Alexis Tsipras rebuilds his government to shore up support for a bailout agreed with the country’s creditors. 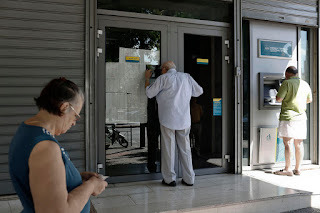 The banks, which have remained closed since June 29, will open July 20, the government said on Saturday. Most capital controls concerning withdrawals and money transfers will remain, and while the daily limit was held at 60 euros ($65), a cumulative limit of 420 euros a week was set, it said. Lenders will reopen a week after Tsipras and creditors agreed to a bailout program and Greek lawmakers approved legislation needed to release funding for the country. Hours after the vote, the European Central Bank approved emergency financing for the country’s lenders and the European Union finalized a bridge loan on Friday to provide a stop-gap until a full three-year rescue program, worth as much as 86 billion euros, is settled.